VINELAND, New Jersey: A New Jersey man who survived accidentally shooting a 4-inch ( 10-cm) nail into his heart while trying to clear a jammed nail gun said on Friday he feels like he won the lottery. Dennis Hennis, 52, who was revived from cardiac arrest before being airlifted for surgery to Cooper University Hospital in Camden, New Jersey, laughed off Dr. Michael Rosenbloom's suggestion that he buy a lottery ticket. "I've already won the lottery," said Hennis of Vineland, New Jersey, in an interview. "I got a new grandson on my birthday on March 23 and a week later I'm almost dead. Now we can celebrate birthdays together," he said. Hennis, a self-employed builder, was working with his son, age 28, on a neighbor's roof on Saturday when his nail gun jammed and he tried to clear it, mistakenly pointing it toward him. The powerful tool was built to fire 4-inch nails at 120 pounds per square inch (8.4 kg per square cm), said hospital spokeswoman Lori Shaffer. "It was about a foot away and it went right into my chest, right into my heart," Hennis recalled. 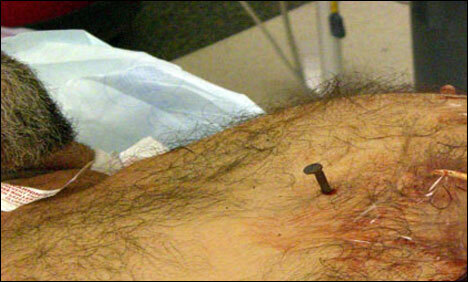 The nail pierced his right ventricle, which supplies blood to the lungs, and Hennis soon went into cardiac arrest. Hennis, whose son called an ambulance, was rushed to a local hospital and revived but clearly needed immediate surgery at a trauma center like Cooper, nearly an hour's drive away, Rosenbloom said. "Imagine there is a nail in the heart and they have to do CPR. It turns a little puncture wound into a laceration," the surgeon said. Fog had grounded the medical helicopter but it suddenly lifted and Hennis was flown to Cooper and rushed into the operating room. Hennis' recovery from surgery has been remarkable and he was expected to be discharged in time to celebrate Easter with his family, including his third and newest grandchild. "We closed the hole and his heart is strong," Rosenbloom said by telephone. Hennis lucked out with knowing to not remove the nail himself, prompt medical attention and suddenly cooperative weather, Rosenbloom said. "I told him he should go play the lottery," the surgeon said.